Whenever I’m in a bind or just simply out of idea of what to cook, my go to meal is usually a stew. Stews are usually very easy to make, requires no special equipment or technique and can be healthy. You can have an all meat stew, like my Pork Stew, or you can add vegetables like carrots, root vegetables or even leafy vegetables like spinach or kale. I usually serve it with rice, but if you’re not a fan or rice, mashed potatoes or even by itself. 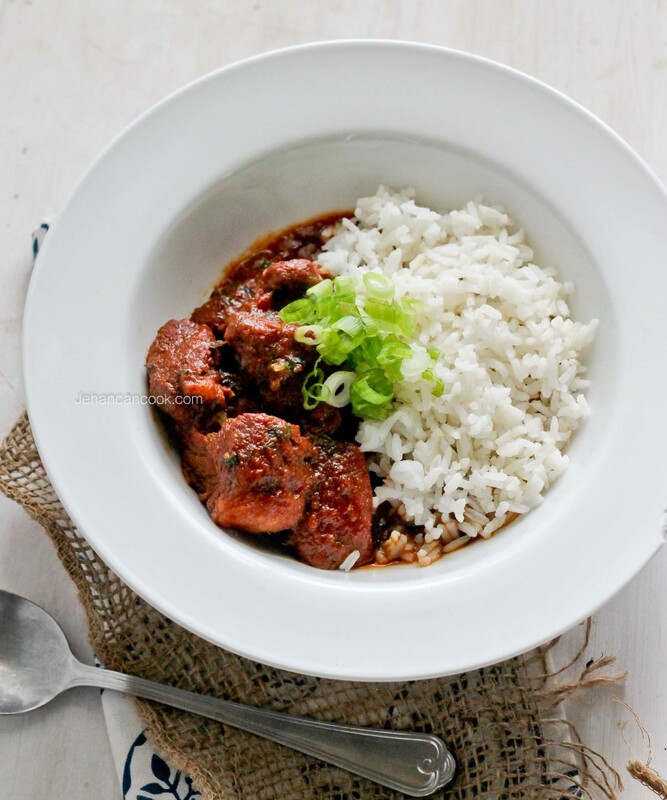 For this recipe I used cassareep ( a thick black liquid made from cassava root) to give the stew a darker color and a unique flavor. A lot of Guyanese tend to only use cassareep for pepperpot, but it can used in everyday recipes to flavor stews and even soups. My husband who doesn’t like Pepperpot(the horror) loves it in stews. 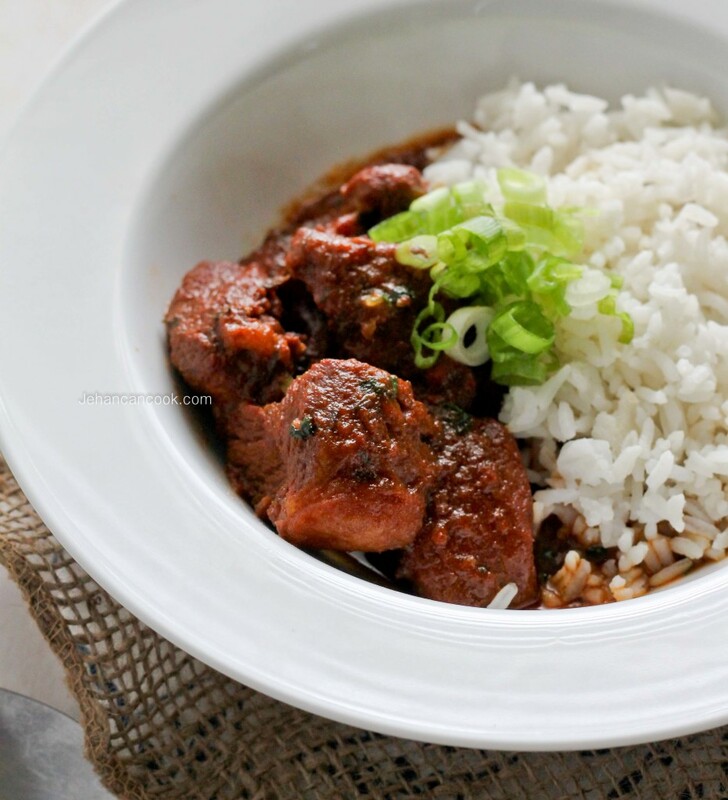 Do you use Cassareep in any other dishes other than Pepperpot? 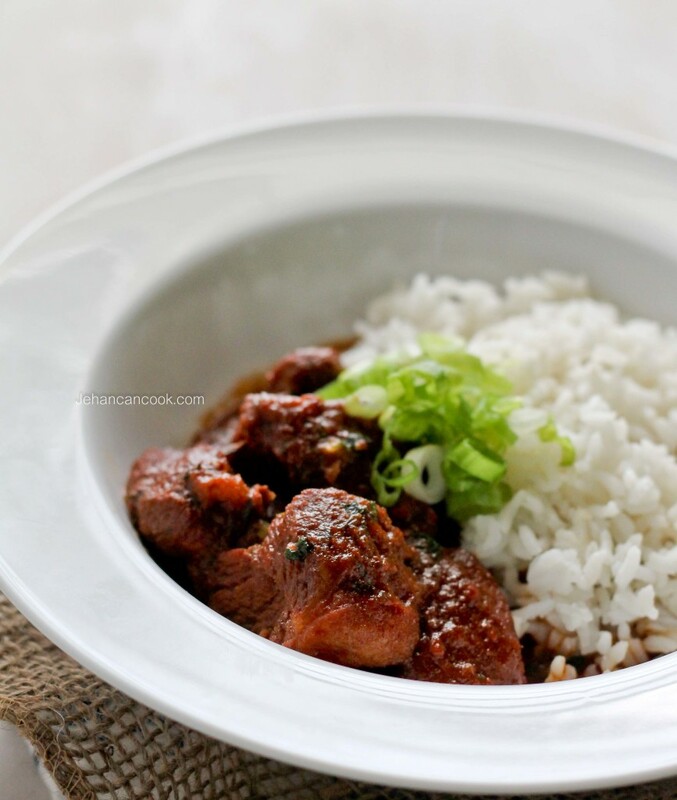 Place pork, ginger, garlic, Worcestershire, ketchup, thyme, hot pepper, salt and scallion in a bowl and mix to combine, the let it marinate for an hour. Next in a heavy bottom pot over medium heat, add oil and ¼ cup sugar. Allow the sugar to caramelize; when the sugar turns dark brown, add meat and stir to combine then and cook for 15 minutes. Add tomatoes, onion, 1 tbsp of sugar and cassareep and cook for an additional 10 minutes, until the tomatoes begin to break down. Add enough water to cover the meat, bring to a boil, then lower the heat to a simmer and cover pot, then cook for 45-50 minutes, or until the meat is tender. Taste to see if more salt is needed, add according to taste. Remove from heat and garnish with chopped cilantro. This is best served with rice. It looks delicious! Do you cover the pot when you are simmering? HI Blu, yes the pot is covered.